It's Glenn here. I am going to get into trouble for this but hey, I will be at work before Sharon gets to see it! Don't forget to leave her a birthday message. She will wonder what's up when birthday emails appear in her inbox! Happy, happy birthday, Sharon! May it be fun and memorable! I wish you a fabulous birthday !!! That is one very brave man! Happy birthday! Happy happy day Sharon!! What sneaky husband you have!! Wishing you a very Happy Birthday Sharon! Have a wonderful day for your birthday Sharon! What a sweet (but sneaky) thing for your hubby to do! Happy Birthday Sharon!!! Hope you are thoroughly spoilt and don't growl at your hubby too much!lol! Happy Birthday Sharon! 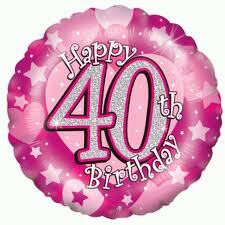 I know 40 is a big one, but don't be worried, life over the hill is fabulous! Glenn is very brave to post on your blog - I hope the idea doesn't catch on. Have a great day. Happy Birthday Sharon 40. I hope that you have a great day and i no that your family will spoil you rotten and you deserve it. 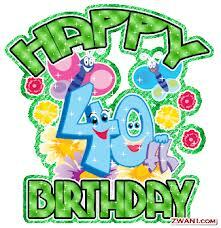 Enjoy your 40th it is a great time in your life. Oh keep your hubby close! He's gorgeous! Have a great day and a HaPPy BirTHDaY Sharon... all the best for this special day and MaNy MaNY more! Hippy,Happy,Hoppy Birthday Sharon! And well done Glenn, fabulously done. Oh my! I have just got home and fired up the computer and now realise what the cheeky grin was all about and on Glenns face this morning! Thank you Spunky and also a huge thank you to everyone who has sent me a birthday wish. He's a keeper Sharon, What a sweetie to be so thoughtful. Have a wonderful day. Happy Birthday! hope you have a great day, love the cute photos ! Happy birthday and what a hubby you have. Must have been a pleasant surprise. Enjoy the day. What a sweet (and extremely brave) husband you have. I bet he's had that grin on his face all day too thinking about what he's done!! (well done Glenn) -love the photos too! It isn't as bad as it sounds. HAPPY BIRTHDAY SHARON!!!! Hope you have a lovely day filled with family,friends,pressies and off course champers :) Barb. Omgosh... he's hacked into your blog! Hahahaha... I love it! 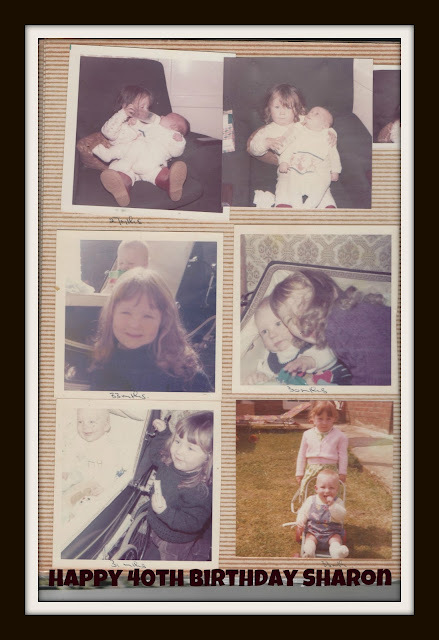 Wishing you the happiest of birthdays Sharon... hope you get totally spoilt! Happy birthday Sharon! 40 is not that bad. 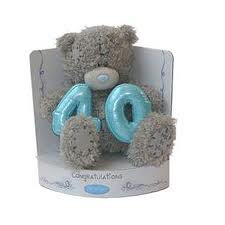 It honestly doesn't feel any different now that I am over the shock from turning 40. Love your blog! You're an inspiration and find that anything you do I just love.